Brian Murrihy is one of the most ingenious product designers we have met. Not only because of his vision, but also because of his power to align and inspire others. Watch in this interview how he politely asked and obtained the domain Lumo.com from Microsoft for free! He also received much help from Oxo, Victorinox, among others. Later he shares some thoughts on attending MIT Sloan. 1:02 - Begins to share how he acquired Lumo.com from Microsoft for free. 2:50 - Summary of how Lumo.com was transferred from Microsoft. 4:22 - Video quality finally improves! 4:59 - Explanation of why Brian's format worked. 6:19 - Key points of persuasion. 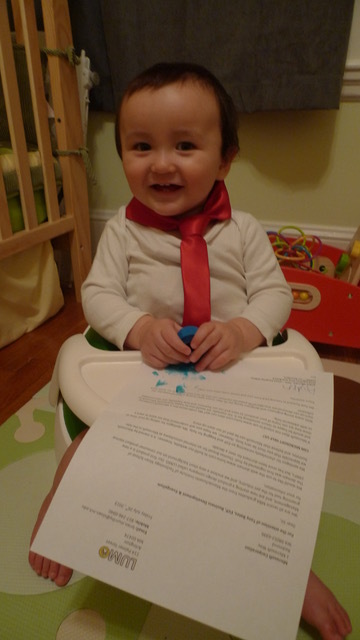 Photo of Brian's son (aka CTO) signing - Included in the letter. Letter - PDF of the letter contents. Presentation - PDF of Lumo Pitch, included in the letter. Lumo.com - Their finished product today, see how it works. 6:42 - How he convinced a manufacturer in China to prototype the product for free. 8:45 - Contacting Oxo and other famous brands to get their manufacturers. 10:29 - Oxo introduced Lumo to their Chinese manufacturer. 11:22 - Convincing the manufacturer to prototype and test his design. 13:58 - Getting insights from Swiss Army Knife company, Victorinox. 17:02 - How to persuade and humbly ask C-level executives. 20:45 - How to get into MIT Sloan's MBA program. 25:52 - Clubs to join during MIT Sloan's MBA program to help with startups. Owen: Brian, thank you so much for joining me on this You Exec interview. I know we've talked a number of times, and you were telling me the story of how you got lumo.com for your company, which is a pet grooming device. You could tell us more about that, and while we're chatting we're also going to talk about the different methods of persuasion that you used [00:00:30] to first be able to get the domain lumo.com, but then to be able to get or receive trade secrets, or what other companies would consider trade secrets so that you could launch your startup. Owen: Tell me a little bit more. I remember you were telling me you were very interested in getting lumo.com for your business, and there was a fascinating story behind it. Can you tell me a little bit about that? Brian: Sure. So [00:01:00] we discovered that the domain was owned by Microsoft when we were naming our company. Brian: Yes. It had been registered in the late '90s. It was used for some time by an internal consultancy, but after that, the domain remained dormant. We first contacted Microsoft to ask them if we could purchase it from them. [00:01:30] We contacted the registrar, and they weren't able to help, but I decided not to stop there, and decided to write to the C-level executives of the company to explain to them what we were doing, or our startup was doing, what we were trying to create. Owen: And how did you [crosstalk 00:01:50] get the contact? Sorry to interrupt you. I think there's a little bit of a lag, but how did you get the contact details of the C-level executives, or at least [00:02:00] their private email addresses, that doesn't go to their assistant or what have you, and then gets deleted? Brian: We didn't email. We wrote letters to them, and we described what we were doing, and we included pictures of the product we were developing, and it was also signed off by my young baby son, because it was a family story. It's my wife and I are involved in starting the company and we're all in this together, [00:02:30] and I just wanted to present a genuine story about how we were trying to start a company, and that it would mean a lot to us if we could have lumo.com for the name, which is the same as the name of our company. Owen: So you basically wrote a physical letter, like snail mail letter, and you had your son sign it, your baby son at that point, [00:03:00] and how did you know what address you had to send it to to send it to the CTO or CIO of Microsoft? Brian: Sure. It was a long shot but we sent it to the relevant executives, and addressed it to the headquarters in Washington State, [Richmond 00:03:24] I believe. Yeah. Owen: Okay. So you made the plea [00:03:30] to, "Hey, can you please give me lumo.com?" And what happened afterward? Brian: So yeah, we were quite surprised that we actually did hear back from one of the executives, Tony Bates, who was at the time the EVP for evangelism and business development. So he agreed to transfer the domain to us, and we were really surprised by that, and we're [00:04:00] grateful to Microsoft for them doing that. Owen: So do you have a copy of this letter that you sent them? Is there a way that I could get a screenshot of it to also display to our members so that they can better understand how simple the letter was? Owen: That should help. That'll be fantastic. Wow, and the video quality just improved dramatically right now, so that's great. So after you sent this letter, so let me just summarize. [00:04:30] You realized you wanted the domain name lumo.com, Microsoft owned it. You reached to the main registrar to purchase it; they said no. Then you drafted a short letter, you sent it to the executives of Microsoft, CIO, CTO, what have you, and you heard back, "Yes, we'll give you the domain name." Brian: Right, that's it. [inaudible 00:04:56] Starting a company, you often find that [00:05:00] people can't say yes, not because they don't want to, but because they don't have the power to. We did our best to contact Microsoft by the registrar, and of course, we got a no, but we didn't stop there, and we wrote a personal story, and wrote it to the people that can actually make the decisions and help us, and indeed they did. Owen: And to avoid the gatekeepers, you basically wrote an official letter, [00:05:30] albeit your son at that point signed it. It was with an official letterhead from Lumo, requesting asking if lumo.com could be given to you to pursue your startup. Brian: Absolutely. So the reason for that is just to humanize the letter, because people often need help. It wasn't a trick or a game, but it was for Microsoft to understand how important [00:06:00] to us it would be to have it, and who we are. We were a small startup, and we're working hard, and people could empathize with that, and I think that those are the two key points. Owen: So in a way showing your vulnerabilities, because then they're humanized. I see. So then after you got the domain name, you were telling me how to find a manufacturer in China, you sort of did the same thing in a different way. So just to give our viewers a little bit of background, you were developing a pet grooming device. Imagine a pet grooming device on steroids, that [00:07:00] I'll put an animation to show what it is, but you didn't know who to contact in China to develop this. Can you tell me a little bit more about how you found your manufacturer, and the persuasion techniques that you used to get that information? Brian: Sure, absolutely. So the first concern when manufacturing a product is that your design and your intellectual property may be stolen, [00:07:30] so it's not difficult to find a manufacturer in China, but it is difficult to find a very good one that produces a high quality, and one that has the integrity not to knock you off and sell to other markets around the world. So when we were designing our product, we looked around. We looked around the shelves of stores to see where's the equivalent quality that we need, and we found it in kitchenware. Owen: So sorry to interrupt you, but how did you then contact the CTO [00:08:30] or the chief, I don't know, manufacturing officer, or what have you, at OXO? Did you also write a letter requesting the information, or did you contact them? How did you pass the gatekeepers that would never let you connect with them? Brian: Yes, and in [00:09:00] fact, we had to do that more than one time, because initially they were unable to provide us with the information. It's proprietary, and they didn't want to give that out, but we wrote again, and explained what we were doing in more detail. We were able to come to an agreement that provided we wouldn't do anything in the kitchenware space, and we're in a different industry, and we're not competing in any way. [00:09:30] Once we could reassure them, then they were willing to help us. I think in the first instance they're very guarded, because they didn't know if we really were the small pet [crosstalk 00:09:41] or their competitor. Owen: So you wrote a letter to the CTO of OXO, basically saying, "Hello, my name is Brian. I would like to know who your manufacturer is." They actually replied to you also by snail mail, or did they send you an email? Brian: No, so once we made the contact, then the discussion [00:10:00] continued by phone and email. Owen: Fantastic. Then you sent a second letter or email making it clear to them that you're not going to be competing in the kitchenware space. You're going to be in the pet grooming space. They should have no fear to share this information with you, and then out of the willingness of their heart they decided to share with you who their manufacturer is. Did they also introduce you to them, or how did that work? Brian: Yes, so they [00:10:30] introduced us to their manufacturer. Owen: So did you pay them? Brian: No. They helped us, but we explained to them who we are, and we were completely open and honest about that. They did ask questions of us. They needed to be reassured that we weren't a competitor in disguise, that we really were a small startup, and since we were in a different space, they were willing to help, and they put us in contact with their manufacturer. Owen: Okay, got it. So you [00:11:00] got the domain name lumo.com from Microsoft for free, which is well worth over a $100,000, or I would imagine a four-letter domain name is pretty valuable, especially if it sounds nice, consonant, vowel, consonant, vowel. So then you have OXO give you a trade secret, which is their Chinese manufacturer. Now, how did you then go about convincing the Chinese manufacturer to work with you? Because at that point, you're a nobody. [00:11:30] How did they know who you are, and that you were legit? Brian: Sure. That's a very good question. Thankfully, that manufacturer in recent years experimented working with another startup, and that startup created the Contigo drink canisters that are now very popular. They don't leak, and they're very well built. Owen: But I'm sure they get hundreds of pitches from designers and product developer agencies all around the world, asking them, "Hey, [00:12:30] please work with us." Are you just being extremely humble, or did you use a persuasion technique that convinced them to realize that they should trust you versus some German company, or some company from South America, or Asia, or what have you? Brian: Sure. So we certainly had to explain how our industry, the pet industry, is changing, and that how people are treating their pets [00:13:00] like their own children. It's a recession-proof industry. Annually, the industry grows by 4% without any hesitation in economic down times, and it's a huge market, worth $60 billion in the US alone. So we had to explain to the manufacturer that it has huge potential, and moving forward with the Internet of Things and a lot of the other things that are coming onboard to help connect with pets, and to help improve their lives, that there's a [00:13:30] huge market that's growing there, with an insatiable demand. Brian: It's a space that they currently weren't operating in, so it was attractive to them. Owen: So you proved to them that, one, it's attractive, the seasonality of the pet industry's opposite to the dramatic upturns and downturns. Then you showed them that your team, your company, is very viable and that you're serious to push this company. Now, I know you were telling me of another side [00:14:00] story, where you ran into some issues connecting metals and plastics, and you then reached out to another company to get their insights as to how they do that. Can you share a little bit about that and the persuasion that you used to get those trade secrets as well? Brian: Okay. Is that Victorinox? Owen: Yeah. Yes, correct, correct. Owen: How did you wake up and convince yourself that you should, one, contact, reach out to them, but two, that they would even be open to sharing with you, [00:15:00] again, some trade secret about their design or manufacturing? Brian: Sure. So we already had the benchmarks of working with Microsoft to persuade them to help us, and then we had the kitchenware brand OXO, but the root of that mindset came from a YouTube video in which Steve Jobs explained how he got help from Bill Hewlett of Hewlett-Packard when he was a nine-year-old boy at school. He called up [00:15:30] the owners of HP, and asked them for spare parts for an automated counting device, an electronic device at school. Essentially, the bottom line is it doesn't matter who you're asking for help, folks are willing to help if they feel that you deserve it and you're genuine, but if you're asking a company for help, you then have to ask people higher in the company [00:16:00] in the hierarchy, because folks in the middle or the bottom would want to help, but are unable to. They don't have the permission. That's essentially the principle, and it's heartwarming to see that aspect of humanity, where people will help you if you deserve it, if you're genuine, and if they can. Owen: So it's rare that I do an interview, and be it by persuasion or some technique, someone goes out and [00:16:30] reaches to the C-level executives of three companies and one Chinese manufacturer by cold-calling or sending a cold letter, asking for trade secrets that they would otherwise not share with their competitors or others. Is there a book on persuasion? Is there a 800-pound gorilla that we're not seeing here, or is it just showing [00:17:00] your vulnerabilities and looking to see if the other side has a human element? If you were to convince me to give you something for free, how do you do that? Brian: Sure. Sure. So I think there are two aspects to it. The first is as you mentioned the human side to just be open about who you are and your vulnerabilities when you're asking for something. Essentially, we're asking for help mostly, but the second is, [00:17:30] how do you structure that? How do you write it in a polite away but in a persuasive way? And while I was at the B school at MIT, the principles of [Cialdini 00:17:43] were taught in the communication class, and Cialdini describes how one can be persuasive using different tactics and structures. I'll give you a couple of examples. One is liking, so if you're [00:18:00] positive, and people like you, then it's easier for them to get onboard. Another is reciprocity, so if I help you, Omid, then it's more likely than not in the future that you'll help me, because we've exchanged something, and we want to help each other. Owen: [crosstalk 00:18:22] or what you. Brian: Sure. Another one is scarcity. It's like [00:18:30] this is a rare opportunity, or, "We need your help because this is a particularly unique situation." So if you look at his, Cialdini's, principles of persuasion, it's really just about setting up the key points to another person to give them a sense of urgency, and a sense of getting onboard with what you're asking them to do. Owen: Was there an element of describing your mission, or making [00:19:00] it sound like a spiritual achievement for them to help you? Is there an ingredient here? Because the steps that you're mentioning are well known, but seldom do I see someone, again, even reach the C-level individual, because typically the gatekeeper will just stop them, or anything that sounds salesy or marketing-like. Maybe they were just confused because it is [00:19:30] a very unique ask. Can we dive deeper into this? Is the letter unique in any particular way? Brian: Not greatly, only in that, as you said before, it shows our vulnerability. It's completely open and honest about who we are, and who we are as people, so we're not just, sorry, we're not just contacting them as a startup company. [00:20:00] There's a story behind the folks at that company, too, [crosstalk 00:20:05] who were involved, and it included everybody whenever we told our story. It was about me, my wife, who's also an MIT grad, and our kids, and how all of ours hopes and aspirations are tied into that. If we fail, we're not going to be on the street, but we're putting our heart and soul into this, and then when people understand that, that you're being genuine and polite, and that it means a lot to you, they'll give you some [00:20:30] attention. It's perfectly acceptable for them to say no, and there's oftentimes where we've communicated to folks where we didn't get a response or we didn't get help, but there are times when you do, and it's amazing, and we're grateful for it. Owen: That's a great story, between Lumo, the Chinese manufacturer, the Swiss Army company, OXO. This is just a great track record. Talking about track record, you mentioned MIT and [00:21:00] the MBA program, and that's not a very easy school or program to get into. So maybe could you share a little bit more about your background prior to MIT, and the things that you did to apply to get into the program? Brian: Sure. So prior to [inaudible 00:21:20] the MBA at MIT, I was a senior structural engineer at the consultancy named [Arup 00:21:28], who are famous for [00:21:30] the design of the Sydney Opera House, for example, or the Beijing Bird's Nest, and the Beijing Water Cube, and several skyscrapers in London, which I was part of the team working on the design for. So it was a fantastic work experience, but it's a cyclical industry, so I thought about leaving to study an MBA during the economic downturn, when a lot of construction projects were being shelved. Then you're right, [00:22:00] the application process for a B school is quite rigorous. So essentially, you have to just prepare well, and dedicate a significant amount of time to that. Owen: Did you also use the persuasion techniques? Did you send a letter to the dean or something of that level? Brian: No. I wasn't so bold then as I am now, but no, I just went through the application process, but I think you have to [00:22:30] look at what they ask for, and then put a lot of effort into the things that can help you shine and stand out. So my reference letters, for example, came from C-level managers at the company I was working for, which is a 10,000 employee company, billions in revenue. So to get an accolade from a leader in organization is quite powerful. Owen: And in that letter in your application, did you try to target and tailor your message to the [00:23:00] culture that MIT has specifically, or did you [inaudible 00:23:04] So talking about that, how did you identify what the culture was, and what are the messages they need to emphasize? Brian: Sure. So my background is in engineering, and so I felt that MIT was a good fit, but in my application ... At the time of applying I wasn't sure that I wanted to start a company, but ... So in my application, [00:23:30] I explained that the construction industry is worth, at least in UK, probably about the same in the US, it's worth about 10% of the nation's GDP. Owen: So to summarize, not to interrupt you but I'm just looking at the time and I want to make sure we capture enough insights, you explained to the admissions office that [00:24:30] the business side of construction has remained the same pretty much, but also the technology has remained the same, and that the world needs to have leaders that can connect both of them. Then your argument was then that the MIT culture would fit you best, and that once you graduate you'll be able to change the world and so on and so on. Brian: Right. Exactly. The key point is what I was selling MIT is that I'm coming to MIT to learn these skills, [00:25:00] and I'm showing them what the end result is, of how might I aspire to apply them. So actually, ultimately I applied them to my startup, but nevertheless I still apply them and hope to bring credit to MIT in return. Owen: So you basically sell them also as a customer in a way, because you understood what they want at the end of this interaction of giving you an MBA, and you understood that you want the knowledge that they have to provide you. So you [00:25:30] basically sold them your future output in a way in your essay argument. Brian: Right. So that if they can see that this candidate is going to do good things with our learning, apply it well in practice, then I'm going to hopefully be a good representative for the school, so that folks can look to what I have done, and [inaudible 00:25:51] for themselves. Owen: Clearly, while you were there, either you learned a lot of persuasion or you learned something that led you to have such a [00:26:00] track record for Lumo. For the listeners that are MBA students or would like to apply to an MBA program, can you share a little bit about while you were in the program? Are there any groups or courses that could help one understand the topics they deal with? Which is not only persuasion but we're focusing on persuasion now, like price sensitivity, communicating, understanding what niche market to go after, segmenting [00:26:30] your customer base. What are some of the courses and groups that you participated in? Brian: Right. [00:27:00] So these courses, for example, like competitive strategy, that helps you identify an industry landscape and understand where you fit in that, and it's almost like playing chess. You can think, game out your moves, and game theory indeed is part of that course. That's fantastic, because you need to strategize if you're going to win as a startup. You've got to leverage everything you've got. The other examples are pricing [00:27:30] classes, and that's especially useful. If you're bringing a new product or a new service, how do you price that and make sure you're doing the best you can do? I loved that class. There's a psychology behind how you can extract a consumer's willingness to pay, try to get towards the maximum willingness, or to segment the market to basically do the best you can. There are dozens of other courses. The communication classes you mentioned [00:28:00] is one. Owen: I perceive that one of the edges that you have in your startup relative to others is not only your persuasive personality, but the approach that you bring to the pet industry, in that maybe the pet industries is old and has not really updated itself as much. Are there other elements that you're using as edge in the pet industry, [00:28:30] just so that I can identify what other tactics you're applying to allow your startup to succeed more? I know that you're doing this novel product. Are you using the feedback that you're getting to develop new novel products? Just a little bit about that would be helpful. Owen: Especially in the US, and Europe, and other places. Brian: Absolutely. So there I saw a perfect opportunity, so I picked the industry first, and then I started to work on products for it. Along [00:29:30] the way then, as you develop one product, you certainly get ideas for others. Although ideas are easy, executing then takes a lot of time and effort, so ideas are the easy side of things, but one builds connections. One builds an awareness of what consumers want, and identifies new trends. So certainly, going into this space has shown that there's a lot of room for innovation, absolutely, and there's a lot of things coming [00:30:00] onboard at the right time. The Internet of Things I think can really help us look at our pets in a better way. A lot of us like you and I know, we go to work every day. I don't know if you have a pet, Omid, but when you have one left at home, then there's a big need for new and amazing products in this space. Brian: You know what they get up to when nobody's looking. Owen: Exactly, exactly. Brian, [00:30:30] thanks so much for your time, and like you mentioned earlier, I'll try to get screenshots of the letters that you sent, just to show our listeners. And again, if they have any questions, do you mind, if there's 100 or 200 questions, if we set up a followup interview and just go through all of them? That'd be okay with you? Owen: Great, great, and then I'll put up a video of the product that you've developed at Lumo, and thanks again for your time. I really [00:31:00] appreciate it. Brian: No, you're welcome. Thank you, Omid.